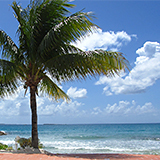 Positively THE place for Anguilla Shopping! How does life get any more irie than this? 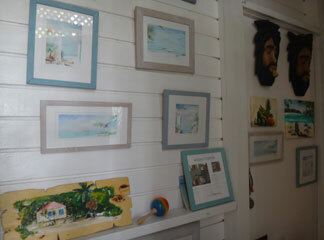 Thanks to the shop of all Anguilla shops... Irie Life. 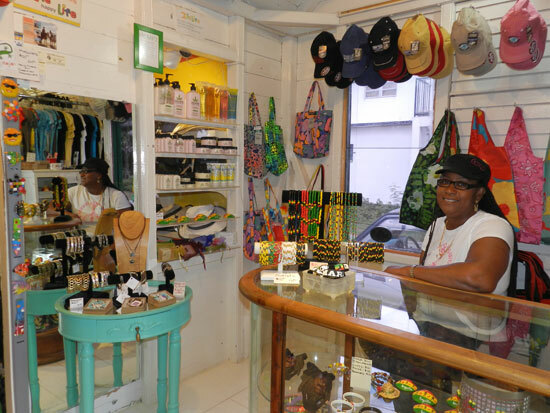 This Anguilla shopping experience was created in 1998 by irie women, dubbed "the girls", so that visitors to Anguilla can purchase what they need in happy, positive, and vibrant surroundings. Does everyone know what "irie" means though? Irie is a Jamaican patois word that means a variety of things... all positive. Irie is the highest state of positivity. When you are irie, you are feeling great. Imagine a shopping experience created to evoke those wonderful feelings. The irie-ness trickles down from creators and owner/operators of Irie Life - the girls. The girls are Agatha, Lynne, Pam and Ulynis. 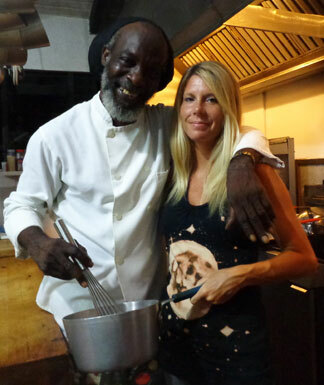 They are well-versed island lifestyle retail mavens that put 100% thought and care in to what they design and offer at the Irie Life shops in Anguilla. 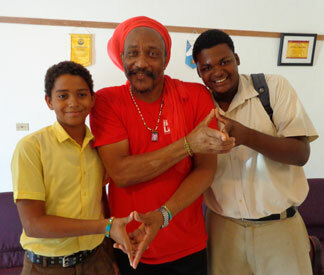 I visited with the Irie Life team to dig a little deeper on that subject. An interesting point to note in my research stems from the bathing suit and swimwear approach at Irie Life. 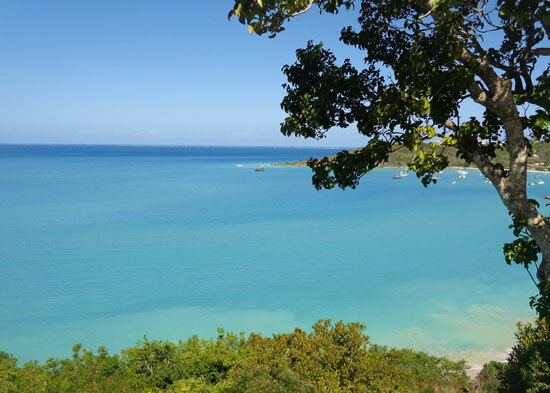 When you are heading for a Caribbean vacation in Anguilla and you determine that a bathing suit is a definite need for your trip, you then have the often not-so-comfortable task of revisiting your swimsuit stash and seeing what fits, what's worn out, etc. If not that, you have to take yourself to a department store and deal with trying on swimsuits that are sometimes way overpriced. Even worse, if you are going about this during any time close to winter... ugh, need I say more? Sure, throw an old suit in your luggage to be safe but come to Anguilla, and get yourself to Irie Life where the "the girls'" unofficial motto for the swimwear collection is, "If you can't find a swimsuit that is beautiful and fits you well, then we aren't doing our job correctly". The changing area is immediately next to the swimsuits. The girls, or at least one of them, is right there to hand you more, offer suggestions, give advice, etc and they are good at it! 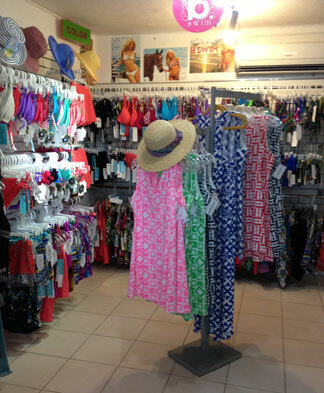 The environment is ideal for swimsuit shopping AND their selection has something for everyone. I've witnessed this first hand. My mom doesn't find swimsuits that she likes and fit properly to be an easy and therefore, not so fun, task. Her success record at Irie Life is a positive one! The girls consider reality when they determine what swimsuits to offer. The girls are also honest in their feedback, if you need it. It is really important to them that you feel good in and about your bathing suit. They have tankini's, "teeny" bikinis, one-pieces, and standard yet unique and sometimes versatile bikinis. There are boardshorts and trunks for men too. My first reversible bikini is thanks to Irie Life. Fully adjustable with black on one side and bright yellow on the other, it was purchased for under $70 US. It's an irie feeling to know that you'll get your money's worth, right? Care and thought go in to each and every item in Irie Life. The Jams World line is another example. Made in Hawaii, USA, the Jams World line is noted as a staple of Irie Life... in every way. The Jams World pieces are made of fabric from Japan and are created to be easy to travel with, fit the casually elegant island lifestyle and they are visibly beautiful. An additional benefit for the Irie Life shopper is that Jams World isn't found many places. In the United States Jams World is mostly limited to Florida, California and Hawaii. One of "the girls" was telling me about how many years she's had some of her Jams World pieces. They are so comfortable, pretty and easy that it's hard not to grab for the Jams World clothing when you reach in the closet. West Indies Wear is a cotton line that's geared for the Caribbean and Hiho is a clothing line from the British Virgin Islands and isn't found everywhere but is big in places like Newport Beach, California and the Jersey shore. One of my favorite things about Irie Life, besides the irie nature of the place, are the original pieces. My favorite shirt is a one-of-a-kind black tank top from Irie Life that has an image of the full moon on it. 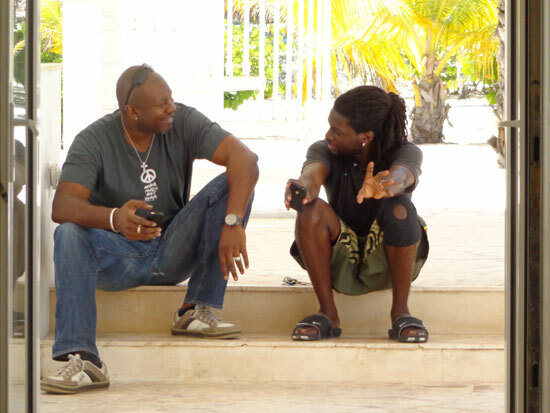 My friend, Joyah of the Anguillian musical band British Dependency, is a regular to Irie Life. She has a similar tank top with an image of Africa on it. Original art on a durable, stylish, cotton tank top! They are works of art that you can wear... and original works of art that no one else in the world has. Considering this exclusivity, they are a tremendous value. 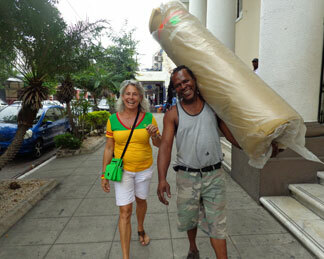 In fact, plenty of the clothing is custom-made, especially for Irie Life even though those pieces aren't called out. To me, this is a testament of the importance "the girls" place on the needs of their customers. 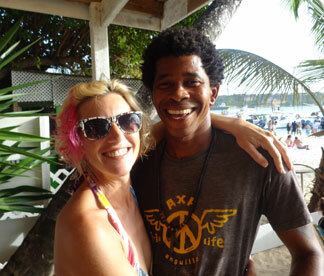 Irie Life is the place to get your AXA t-shirt! You may have noticed the "Bob Marley everything" above. That is an exaggeration however, Irie Life carries many things that honor and keep present the man who, through his music brought the world, "One Love, One Heart, Let's Get Together and Feel Alright" and a plentitude of irie lyrics and music. Irie Life carries Bob Marley t-shirts, backpacks and totes, stickers, wallets and books. 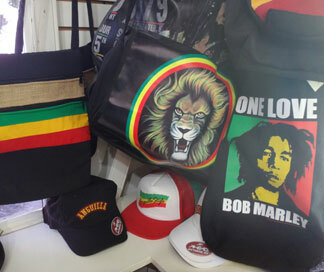 Appropriately, Irie Life has some of their Bob Marley and irie totes hand-made in Bob Marley's home island of Jamaica. The beads and jewelry section is always abundant and versatile. 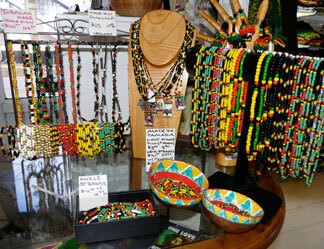 Of course, most of the jewelry reflect the colors of Irie Life (ties, green and gold) and other vibrant, happy colors. Naturally one of Irie Life's motto's is. "Let Irie Life color your world". And where exactly can you get your world colored? 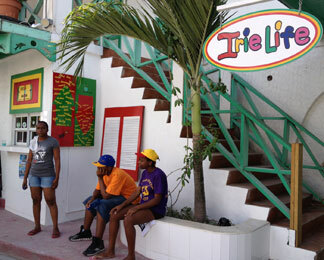 Irie Life has two locations in Anguilla. First, there's the original shop that was started in 1998 and is housed in a century old West Indian cottage on Back Street in South Hill, Anguilla. 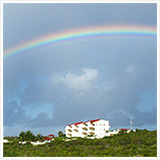 It is possibly one of the cutest, most vibrant buildings on the island. . The South Hill location is the largest and carries everything that I've mentioned above. When you enter the shop through the front porch, be sure you see all of the shop... The front half of the house is connected to a back half via a corridor where the hand-painted gifts, paintings and books are located. 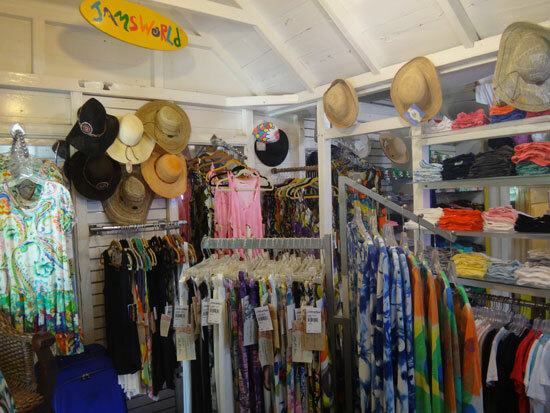 The second half of the shop is where you find much more, including all of the women's swimwear and those beautiful Batik pareos. It's also inches closer to one of Anguilla's most photographed areas... the Sandy Ground overlook. Be sure to make your exit from South Hill this way and get some photos from the overlook... you won't be sorry! 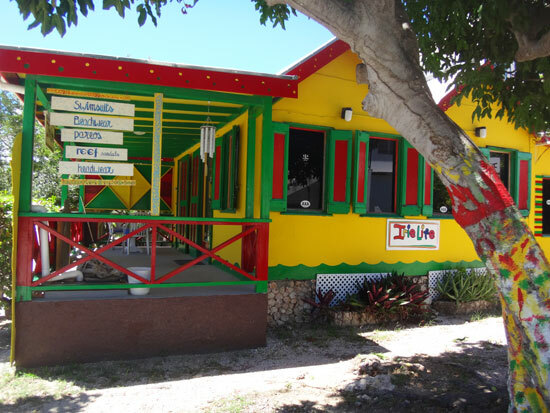 The other Irie Life location is the newest and is conveniently found on the Sydans. This shop has less volume but still offers the same products as the South Hill location. 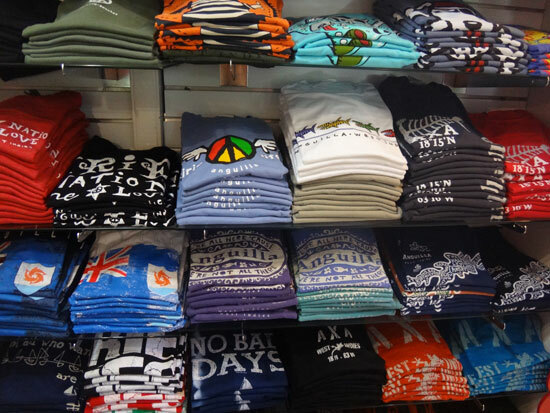 You'll find t-shirts and coverups and more plus... when you are finished shopping, you can walk across the street walk the beach and go for a swim in the calm waters of Road Bay in Sandy Ground. Irie Life really does color your world! Irie Life swimwear and t-shirt! Directions: See the map below for full directions to Irie Life's two locations.